This week is an extra week, so we are enjoying it by getting together to do a no-group-restricted, themed reveal day. The theme is HOLIDAY TREATS. I naturally decided upon cookies. Holidays to me are all about the cookies. Any kind and every kind. My assignment was Wildflour's Cottage Kitchen by Group B member, Kelly. Kelly lives in New Jersey with her husband and super adorable Snowshoe Siamese kitty, Gilbert (go see his pictures on the about me page). I am a sucker for those snowshoes - they are too precious! Kelly has run her own catering business for over 20 years now :) I tell you what, these Secret Recipe Club members never cease to amaze me. They are all such incredible people. I had no problems narrowing down the cookie recipe I wanted to make, but be sure to stop by Kelly's blog and look at the immense wealth of recipes she has posted. There are too many good ones to choose from ordinarily. One cookie recipe stood out to me right off the bat and that was the Salted White Chocolate & Butter Rum Pudding Cookies with pecans. 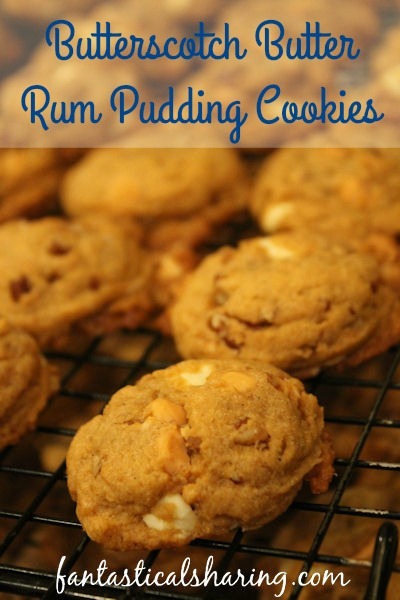 Nick LOVES butterscotch and he loves rum and I love pudding cookies. So it was really a no-brainer. I only slightly adapted Kelly's recipe because I couldn't find butter rum extract. I also was so excited about getting these done that I completely forgot to salt them. But I assure you, still so tasty, cannot be beat. Perfection, y'all, perfection. Cream together butter and sugars until light and creamy, about 3 minutes. Add pudding mix and mix until combined. Add eggs and extracts and mix until just combined. Stir in the flour, baking soda, cinnamon, and salt and mix until dough comes together. Fold in chocolate chips, butterscotch chips, and pecans. Using a cookie scooper, drop rounds of dough onto a parchment paper-lined or silicone mat-lined cookie sheet. Lightly press cookies down. Bake in a preheated-350* oven for 10 to 12 minutes. Remove from oven and let sit on the pan for 2 minutes before removing to a wire rack to cool.